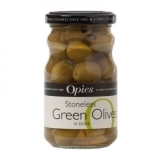 Small jar of Opies pimiento stuffed green olives. Opies use the finest Spanish Manzanilla olives harvested in the autumn, stuff them with pimiento and preserve them in brine to deliver a high quality flavour. Perfect for cocktails - a classic Martini, a Campari Spritz or Astoria. Delicious on their own or accompanying tapas dishes. 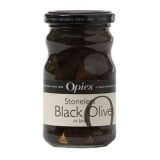 Fantastic for canapes - olive and cream cheese, olive and salmon, olive and anchovy palters - the list is endless. 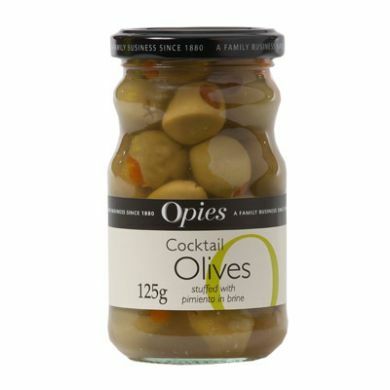 Also use Opies Cocktail Olives Stuffed with Pimiento for snacks, garnishing pizzas and salads. Caution: May contain undetected stones. Olives, water, pimiento, salt, acidity regulator: lactic acid, stabilisers: sodium alginate, guar gum, firming agent: calcium chloride, preservative: potassium sorbate. This product may contain an undetected stone.